Our food stash is full of exotica these days, as friends and families who visit bring me food presents which they know I will appreciate. C in particular was very excited to share this new treat which she is madly in love with. 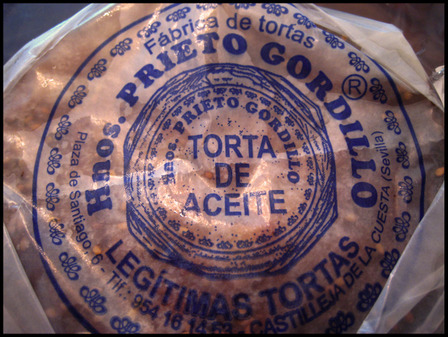 Torta de Aceite originates from Seville, Spain and is a biscuit made with wheat flour, almonds, olive oil, sesame and anise. Knowing my antipathy towards licorice and anise flavours in general, she warned that I might not like it but to also give it a chance anyway. We therefore approached with much caution, the oily wrapping paper not making it less intimidating but after our first hesitant nibbles we realised that the anise flavous is subtle and gives it a unique finish. In the beginning it is hardly discernible; the heady scents of sesame, olive oil and almonds are noticed first, followed by gratifyingly crunchy-crisp (somewhere between pizza bianco and palmier) sweetness with the anise providing a not unwelcome jolt at the finish. 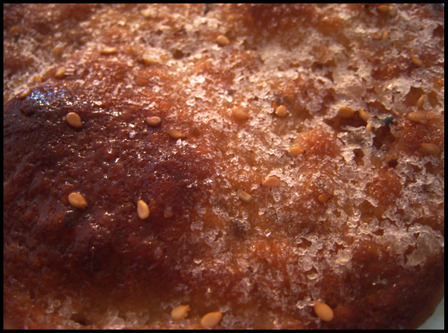 The anise gives this cookie highly addictive qualities, cleansing the palate just enough to make one reach for yet another morsel, and another, until to one's surprise, the packet is empty.